Purpose: Used after floating to produce a smooth, hard, dense slab surface. What's available: Steel trowels look similar to hand floats, except the blades are thinner and the handles are open rather than closed. The key difference among tools is the type of steel used for the blade. The most common types are blue, stainless, and high-carbon steel. Blue steel is thin and lightweight, so it flexes slightly under hand pressure. Stainless steel blades will not rust or stain concrete surfaces. Trowel dimensions from range from 3 to 5 inches wide by 10 to 24 inches long. Be sure to purchase an assortment of trowel sizes. Generally, a 14 x 4-inch or 16 x 4-inch trowel can tackle most decorative finishing jobs. But on large projects or when you need to cover more area faster, then a larger fresno (see description below) will be the most efficient. 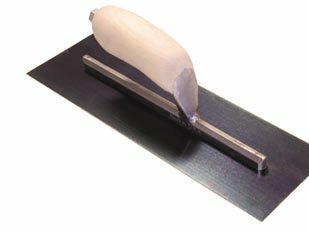 For small patching jobs or when working in tight areas (such as corners, steps, and around floor pipes and drains), you'll need a smaller tool, such as an 8x3-inch midget trowel. Trowels are less likely to gouge the surface after they're broken in because the blades become slightly curved and the edges beveled. If you want to fast forward past the break-in process, you can purchase trowels that have been "broken in" (the edges are pre-ground) at the manufacturing plant. Most trowels come with a choice of camel-back or straight wood handles or more resilient comfort-grip handles. Camel-back handles have a slight upward curve that provides more knuckle clearance. Choose the handle type you find most comfortable to grip and gives you the best control. Also look for handles with sturdy aluminum shanks that are securely riveted to the blade. Average costs: For a 14x4-inch trowel, the cost ranges from about $24 to $40, depending on the type of steel used. Stainless steel trowels usually cost a few dollars more than trowels made of blue or high-carbon steel.